Urethane Bumpers – Impact Resistant Bumpers! Urethane Bumpers ? You’ve come to the right source! Urethane Bumper Feet: Urethane bumper feet are a critical part of many applications from chair leg tips to high-tech medical equipment. Custom urethane bumper feet have the ability to give traction and dampen vibration while capable of holding heavy loads. Custom urethane bumper feet will hold up best in tough applications and will outperform rubber and plastics while holding up to most outdoor conditions. Urethane Slide Bumpers: Urethane Slide Bumpers can be custom formulated to suit your exact needs. Plan Tech specializes in manufacturing both high rebound urethane slide bumpers and low rebound urethane slide bumpers. Custom cast urethane slide bumpers will re-direct product to continue on track down an assembly line or direct products for packaging. 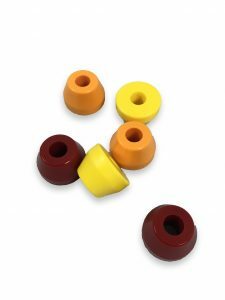 Urethane Bump Stops: Urethane Bump Stops are a block of urethane with a core for easy bolt-on application. Urethane bump stops will absorb an impact and return to its original shape even after years of repeated abuse making urethane the number one choice. Custom profiles of urethane bump stops are no problem for us! Urethane Snow Plow Bumpers: Urethane snow plow bumpers have been attached to plow trucks and ATV’s for decades to eliminate metal on metal contact and prevent slamming while providing some vibration protection and shock resistance to the equipment. Urethane snow plow bumpers are typically made from a solid urethane in a low-cost mold that is customized to fit any piece of equipment by water jetting holes or slots into the urethane bumper to fit OEM factory bolt locations. Urethane Gun Recoil Bumpers: Custom cast urethane gun recoil bumpers are made from proven urethane prepolymer’s from world leading chemical companies. One specialty type of polyurethane is the Adiprene line which has been in service for over a decade. The polyurethane materials are a proven material on many repeating parts making reproducing existing urethane gun recoil bumpers easily available. 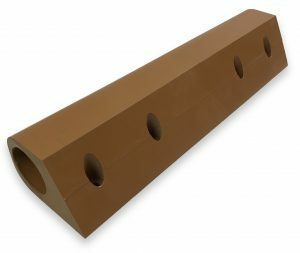 Urethane Dock Bumpers: Most common urethane dock bumpers are cast from a 60A material that is about the same hardness of a car tire. Our most popular bumper is in the shape of a ball with a thru hole for a chain or rope attachment and bolts on bumpers with a molded insert that will not pull out no matter how hard a boat hits the bumper. Urethane Boat Bumpers: You can trust our urethane boat bumpers for applications in saltwater, and our first-grade quality urethane ensures our boat bumpers don’t absorb water. It would, therefore, not be wrong to say that our urethane boat bumpers offer high-performance ability and the fact our urethanes are non-marking means you needn’t worry about the side of the boat being marked by the bumper. Urethane Mounting Bumpers: All we require from you for our team of world-class engineers to help you actualize your next project is a simple sketch. You can count on our urethane mounting bumpers to withstand an onslaught of repeated impacts while still managing to return to their original shapes. And the fact that studies have shown that urethane mounting bumpers have a far better performance ability than rubber makes them the ideal choice for all applications that are in high demand. 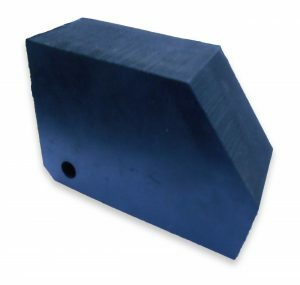 Urethane Dampening Bumpers: Urethane dampening bumpers are cast from high-performance urethane prepolymer for maximum damping ability in all environments. Urethane is a great choice of material due to it being chemical resistance and easily molded into any profile for the applications. Existing urethane bumpers can be reverse engineered for reproduction as well as changing profiles to maximize the dampening ability. Polyurethane Bumper Pads: Tailor-made polyurethane bumper pads can be easily reproduced at our company using a simple sketch or sample part. With our state of the art machine shop and our highly rated engineers, we would design or build polyurethane bumper pads of any specification. Custom Shaped Bumpers: The custom shaped bumpers we offer are capable of remarkably absorbing high-level impact, and they also boast impressive ability to resist wear, abrasion, corrosion, and chemicals. In other words, no other brand in the industry produces custom shaped polyurethane bumpers that offer better performance ability and longer service life than ours. Counterbored Bumpers: Plan Tech’s counterbored polyurethane bumpers provide superior physical properties which are evident in their outstanding capability to resist abrasion as well as corrosion, chemicals, and wear. In other words, our counterbored bumpers offer high-performance ability and long service life both of which help in reducing operating cost. We share your goal of becoming or maintaining your status as an industry leader, and that makes us the ideal company to handle your counterbored bumpers’ project or any other urethane project for that matter. Impact Resistant Polyurethane Bumpers: Impact Resistant Polyurethane Bumpers are widely used in almost all the industries across America. Since polyurethane is resilient and quite strong, durable and has an extremely a long service life, it is used in various industrial applications. The automobile, distribution manufacturing and agricultural industries are just a few of the many industries that use impact resistant polyurethane bumpers. Polyurethane is also a very good shock absorber always returning to its original shape. Best Polyurethane Bumpers: Our best polyurethane bumpers are quite durable and are used in a variety of applications. Applications range from gun recoil bumpers to loading docks. As polyurethane has a longer life than various conventional rubber or plastics, Plan Tech’s best polyurethane bumpers are used across America. Polyurethane can absorb shocks and return to its original shape, it is used in places that have repeated impacts. Polyurethane Molded Bumpers: Polyurethane molded bumpers have the best elasticity to strength ratio. These bumpers are abrasion resistant and durable. From prototype to high volume when it comes to creating custom polyurethane parts, there’s no material – be it an elastomer, plastic or metal – that stands up to abrasion like urethane does. Polyurethane molded bumpers of all shapes and sizes are manufactured in our fully equipped manufacturing facility in the USA our rubber bumpers are the best you will find in the industry. Square Polyurethane Bumpers: Our square bumpers are highly abrasion resistant and can withstand high strength, load bearing, and temperature. They also have high elongation and hardness. They are excellent in resisting ozone and oxygen. We also produce square bumpers with an aluminum base plate as these offer the best corrosion resistance. Polyurethane Car Bumpers: Over the years Plan Tech’s polyurethane car bumpers have become the go-to product for most auto enthusiasts and hobbyists around the country. This is mainly because of its incredible durability and our custom mold making capabilities. Cracks and dents on your car bumpers are a worry of the past with our polyurethane car bumpers. Threaded Bumpers: We can create custom molded threaded bumpers in demanding applications. Made to have a rigid stud for fastening into any surface or made with holes to accommodate a mounting bolt. Whether standard or custom sizes, we produce round, square, and rectangular shapes with a variety of different styles and designs that integrate perfectly into any industrial application or commercial end product. Our custom manufactured bumpers may have a metal insert or core to add to the integrity to the bumper or be able to fasten to another piece. 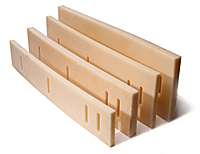 Plan Tech uses the best high-quality polyurethane material available. Bumpers are normally made with an ester polymer that will have less rebound and be especially strong against abrasion. Urethane custom cast bumpers are common to have a hardness of 70A but we custom manufacture bumpers from 20A to 75D. We offer a full in-house machine shop dedicated to making molds and performing secondary operations for our customer’s urethane bumpers if needed. Any color is available and a variety of additives can be added to enhance wear properties for the customer’s bumpers. A metal detectable additive can also be added to the bumpers for X-ray equipment required for FDA requirements. We also cast FDA Dry food approved bumpers. Polyurethanes are outstandingly able to withstand more loads than rubber because they are harder than rubber and yet more flexible than plastics. Plan Tech’s bumpers flexibility is accountable for their strength and remarkable ability to resist impact. Polyurethanes are the perfect choice for applications against severe wear regardless of low temperature. For some decades now, they have been the most used materials for environments that are highly abrasive owing to their super ability to resist abrasion. No other form of elastomers, metals, and plastics has a better abrasion resistance than polyurethanes. Plan Tech’s bumpers unique ability with high wear and abrasion resistance is rated to be 10 times better than what other materials can provide. Like their abrasion resistance ability, the properties of polyurethane materials are highly capable of resisting oil and chemicals. This enables our bumpers to maintain stability (with minimal swelling) in water or oil etc. If you are looking for elastomer materials to use in a wide variety of applications, then polyurethanes should be your ideal choice. Productions such as prototypes as well as one time products, bumpers or one-off parts are often manufactured using polyurethanes. Resilience is generally a product of hardness. Polyurethanes are the perfect choice for elastomer applications that can absorb shock. They have a high vibration frequency or outstanding ability for quick recovery. Their remarkable resilience ensures polyurethanes are very tough materials and an excellent choice for bumpers. For over 30 years we have focused on using speed and precision to manufacture the highest quality industrial bumpers to our customers. A particular strength is the breadth of our in-house capabilities which, when combined with our extensive experience, enables us to deliver impact resistant custom bumpers while maintaining the quality control and cost effectiveness our customers require. The tests are performed according to an established set of standards provided by an accredited testing organization such as the Society for Testing and Materials (ASTM) who define the procedures in detail. In addition to these state of the art technical capabilities, Plan Tech also has an outstanding team of dedicated employees with exceptional talents designing and manufacturing tight tolerance industrial bumpers. Are you interested in cast Urethane Bumpers? Please Contact us so we can help solve your requirements and work with you on your specific application!